Coriolanus isn’t the most well-known Shakespeare play, but contains a lot of issues relevant to current political and social concerns. Caius Martius Coriolanus (Ralph Fiennes), a brutal hero, swears vengeance on his fellow citizens and is subsequently banished by his mother, Volumnia (Vanessa Redgrave). Hell bent on exacting revenge, he offers his life and services to sworn enemy Tullus Aufidius (Gerard Butler), heading an army capable of wiping out the entire city. Tackled by actor/thespian Fiennes – who makes his directorial debut on the film – and screenwriter John Logan, Coriolanus is ushered into the modern day with a commendable boldness. Not only does Fiennes display a raw, stripped-back finesse towards direction, which helps represent Coriolanus’ focused mind and thirst for superiority, but he also uses the services of Logan and cinematographer Barry Ackroyd to his advantage. Unfortunately, however, no matter how hard Logan tries to condense the material (all the while keeping it’s heart and soul intact with the use of Shakespearian language and poetic iambic pentameter), it’s is far too restricted and dialogue heavy for audiences to truly engage with. That said, the fact the issues covered are pertinent to modern day society and the seriousness is forever subverted by hilarious social commentary helps the story to feel somewhat relevant and worth re-telling. With the adaptation of the material shaky, focus instead turned to the performances which, thankfully, are solid across the board. 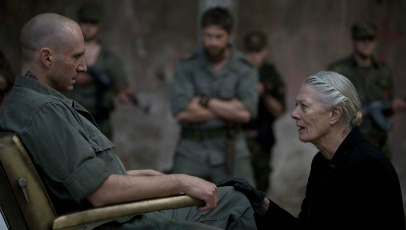 Fiennes delivers a terrifically layered turn as Coriolanus: violent and single-minded on first look, but with a deep level of affection bubbling under the surface. Redgrave excels as Volumnia, while Chastain (Coriolanus’ wife, Virgilia) and Butler show a firm understanding of their characters, but never quite break free of from behind the shadows. Brian Cox and James Nesbit, meanwhile, thrive in their respective roles. It’s always a challenge when it comes to transferring Shakespeare to the big screen, but Fiennes has done an admirable job that, with the aid of a top-notch cast and relevant, subverting social commentary, is worth a watch.